will be released at the end of March 2009! We had a spot of sun today so I was able to photograph finish number thirteen! It's a wedding quilt in search of a wedding. Any young men preparing to propose? Today was day one of the Connecticut/New York Shop Hop. I was at the Quilt Basket. I'm having a significant birthday in 54 days and after today I'm feeling my soon-to-be age!!! I must admit that I'm done for and heading to the couch for some pre-bed napping hand-sewing. 1. Who was that woman? That woman was Fiona Santoianni. She's a graphic designer (book production). And a friend. 2. What is she holding? She was holding a disc containing the file for MY NEW BOOK! 3. Why is she on my blog? Because I wanted to show you all how beautiful she is. And tell you about my new book. And Fiona.... I'm not taking down your photo just yet. Sorry. 1. Who is this woman? The answers to 1 and 2 will be fully explained soon. The answer to number 3: Because she's sitting at her computer waiting to see when I'll upload this. And because she took the photo of me that I use online. In case you think that this is a repeat post, check the binding. This binding is black, and the last was white. And buckle up.... there are several more of these quilts waiting to be finished. It's large enough for file folders and magazines, but I since I hand-stitched the handles in place, I'm trying to travel light with this new bag. The bias trim doesn't lay as flat as I'd like, I may remove and redo it later. I did the quilting on my new Janome 6600. 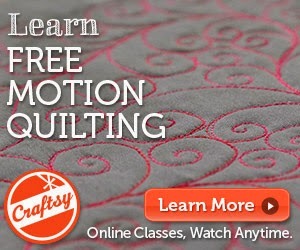 As a longarm quilting teacher, I haven't machine quilted for years and years. Since this project was small and all straight lines, I thought I'd give my Janome a try. 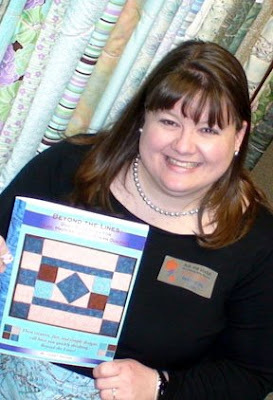 And I would definitely do the next one on my longarm, in case you wonder.